Everything and everyone were excellent. The cleanliness, service, spa and all facilities were great. Attention to detail was amazing! They really make their guest feel so special during their stay. Beautiful property, friendly and attentive staff, good food and drinks and excellent beach and pool. I wouldn’t stay anywhere else after staying here. Everything was just perfection. My family and I had a very relaxing and amazed by the hospitality at this resort it surpassed our expectations from the cleanliness, beautiful hotel decor , all the activities the hotel has to offer , the quality of people , the amazing hotel staff the service was just incredible ! This is by far one of the best hotels we have ever been too especially for the hospitality !! We have been to one of the most luxurious hotels in USA and it doesn’t compare to the hospitality from the staff at Exellence Mexico . We would come back here to have a real relaxing vacation !!! This was our third trip to this resort. If it was our first trip, I would have probably rated it the highest I could, but since being there before I found differences. We go there for our anniversary, and in the past we were pampered more than we were this trip. There used to be a little surprise for us in our room each day, ranging from towel swans to coconut drinks, but this year we only received towel swans on the 2nd day. The staff at the restaurants//bars did not seem as happy this year with the exception of the hibachi. When we left, my husband and I were talking about trying a different resort next year. Really amazing place. I think my main disappointed would have to be the WIFI - it only really worked when you are close to the main building. There is just no excuse for this in 2018 (almost 2019). I understand that many people go there to disconnect from work, but as an entrepreneur, I needed to work for a few hours a day (or to take care of various issues that came up for my clients) - and it made it quite a hassle to do so. The were only a handful of cabanas with decent WIFI coverage. Even when we were just trying to look up information about tours or excursions from our room - it was painfully slow. For the price we were paying, I would expect at least half decent WIFI coverage. In addition, there is no privacy in regards to your bathroom, so get ready to really get intimate with the sounds of your spouse dropping the kids off at the pool. That being said - this place is amazing, and we will definitely be coming back the next time we want to book a tropical vacation. The food is outstanding, the staff is extremely friendly, and there is great music every night. I just hope they make the right decision and fix the WIFI issues for people who can't completely disconnect from work. Great facilities and amazing staff. Food is Ok with many choices. My only complaint is that the pools were not heated as advertised for the winter (we arrived Dec 1st and stayed for a week) and we were not able to enjoy the pools. Located within a mile (2 km) of Punta Sam Ferry Terminal, Excellence Playa Mujeres - All Inclusive - Adults Only is within 3 miles (5 km) of Playa Mujeres Golf Club. This 450-room, 5-star hotel has 7 outdoor pools along with a private beach and a full-service spa. There are multiple options for onsite dining with 10 restaurants, including Toscana, which has garden views. Savor a meal from the privacy of your room with 24-hour room service, or get a pick-me-up at the coffee shop/café. Guests can expect to find free WiFi and 42-inch an LED TV with satellite channels and a DVD player. Beds are dressed in premium bedding and the bathroom offers a jetted tub, a hair dryer, and free toiletries. Other standard amenities include free minibar items, a furnished balcony or patio, and a sofa bed. 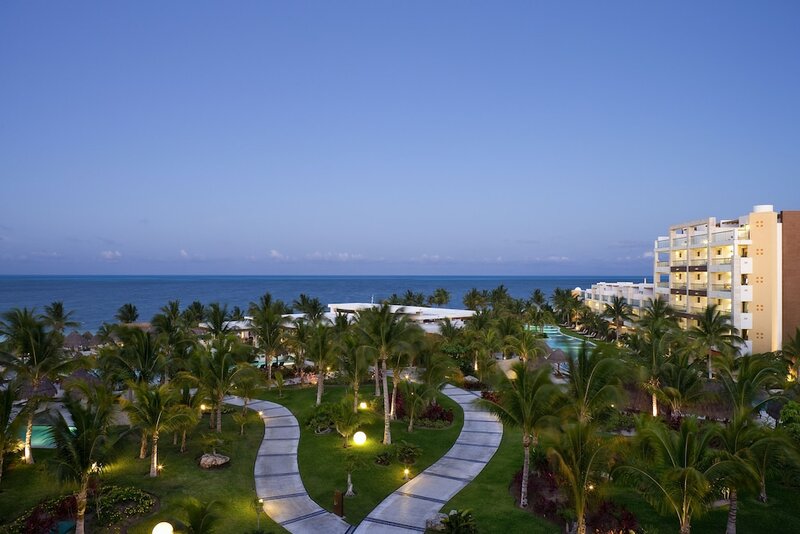 Excellence Playa Mujeres - All Inclusive - Adults Only features a private beach, a full-service spa, and 7 outdoor pools. The 24-hour front desk has multilingual staff ready to assist with dry cleaning/laundry, concierge services, and luggage storage. Other amenities at this adults-only hotel include a 24-hour fitness center, a spa tub, and a sauna. Toscana - Garden-view restaurant open for breakfast, lunch, and dinner. Open daily. The Lobster House - Beachfront restaurant open daily for breakfast, lunch, and dinner. The Grill Restaurant - Beachfront restaurant open daily for lunch and dinner. Barcelona - Fine-dining restaurant open daily for dinner. The Flavor Market - Fine-dining restaurant open daily for dinner. Excellence Playa Mujeres - All Inclusive - Adults Only features a private beach and an outdoor tennis court. The hotel has 7 outdoor swimming pools and a spa tub. A sauna and a 24-hour fitness center are other recreation options. The nearest major airport is Cancun, Quintana Roo (CUN-Cancun Intl. ): 43-min drive, 17.9 mi/28.8 km.